This is one of the longest beer-breaks this thread has had . I was starting to consider hijacking it. Also, non alcoholic beer is for low testosterone beta soyboys. Edited by Elvin at 09:35, 05 Dec 2018. That's only for people who cannot drink alcohol but still crave beer. I have met one, pour souls. Ethics? Work time is not drinking time. it is for our bratwurst and sauerkraut loving friends. but the beer is the same weak sauce used as drinking water substitute in the medieval times, so there's not even a little buzz to it. store bought kvass has more alcohol content than those poor excuses for beer. Ah, they must have substituted water with beer. Sounds ok then. nah, not really. back in the day, there were two options - if you had a clean water source, you'd drink water. if no clean water source is present - you drink was was called "table ale", essentially a very light beer as your main way of hydration. The latter was mostly done in city's and such where all the wells were pretty much contaminated, because people did all manner of things besides them that made the water from them undrinkable. well you could drink that I suppose, if infections and parasites were your hobbies. The pic used on his Tinder account to attract the ladies. If you think of reporting me to the law, remember: I am the LAW. Ok street walker, what you said an ugly thing. Now smile you're on candid camera. Evil and injustice take no breaks but I won't play their game. I'll be back, more refreshed than ever! What? They called to report a homicide, it can't get any worse. The beer, however, CAN get warmer if I don't get my priorities straight. Verstanden? 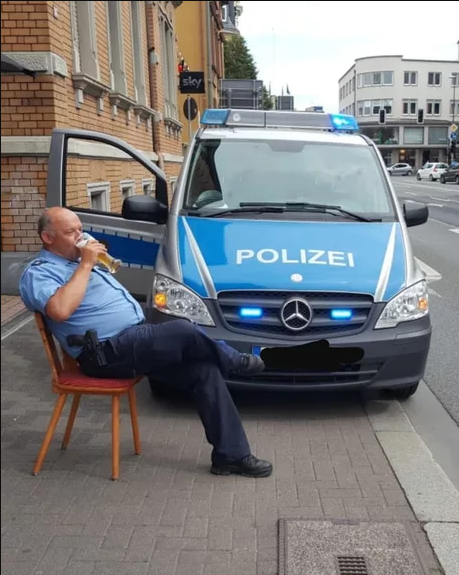 "What, I am drinking on the job? This is not a beer, this is just a whistle-wetter. You should see our standard issue beersteins!" It's OK to break the law if you are the law enforcer. Round 8, to be rated when I feel like it. Very rare picture of the panzerkorps during the Weimar Republic. Panzer trash division strikes back. Edited by Maurice at 10:18, 10 Dec 2018. "When Hanz was asked to camouflage his tank for the operations around El Alamein, his Egyptian style was not what his superiors had in mind ..."
- And what is THAT soldier? - Welll, there was a little complication with my actual tank. It wasn't stolen or anything, I just can't remember where I parked it last night! Edited by Stevie at 12:31, 10 Dec 2018. There is a story behind that photograph which you could say is written in plain sight. That is actually one of the many other pieces of photographic evidence fed by the nazi counterintelligence about the state of technology of the Germans post WW1. The gist of it is that they were actually photoshopped to give enemies of the state the impression that their level of technological advancement was still rudimentary such as to not represent a threat to the League of Nations and other countries/organisations drawing benefit from the Treaty of Versailles. Not only they were advanced, they developed at an alarming rate especially under Hitler's rule who had thoughts of conquest. If you pay close attention, you can see with the naked eye that the military at the top of what appears to be an armored vehicle prototype is actually pasted in without preserving proportions. His left hand also goes over the turret in a way that makes you think it doesn't blend in a cohesive way. Of course, this is easy for us nowadays to see, but to the untrained eye at the time it was more or less impossible to observe or explain, even more so when no one thought that tampering with photographic evidence was possible to that extent. So they added these finds into their reports, taking things at face value without any deeper research while in the reality underneath an arms race was taking place and another war was steadily brewing. When a Lithuanian tank defects to the Germans. 3pts for answer, -1 for being a lame troll, -1 for threadkilling and another -2 for being a soyboy. Round 9 To be rated when I feel like it. "I know that the rations they hand out to soldiers at this point in the war aren't that great - but aren't you overreacting a little bit here?" "You know, when fred said 'screw this tank', i thought he was talking about its perfomance... Not his." Edited by Celfious at 16:38, 18 Dec 2018. Round 8 prior to this one.